We often create and work on multiple Excel worksheets. These could be separate sheets in the same workbook (for example different worksheets for different years, products, departments, etc.). Sometimes, you may need to send a part of the worksheet or a single excel worksheet from the workbook to your colleague or boss. While there can be other ways of doing this, in this tutorial, I’ll show you the fastest and the easiest way to email a single Excel worksheet or a part of the worksheet. But there is some pre-work. 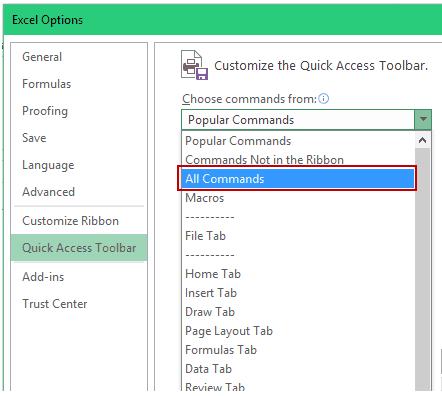 You need to add an icon to the Excel Quick Access Toolbar. This will enable the functionality to send a single Excel worksheet or a part of the worksheet as the Email attachment. Right click on any of the ribbon tabs and select Customize Quick Access Toolbar. In the Excel Options dialogue box, select All Command in the ‘Choose Command from’ drop down. 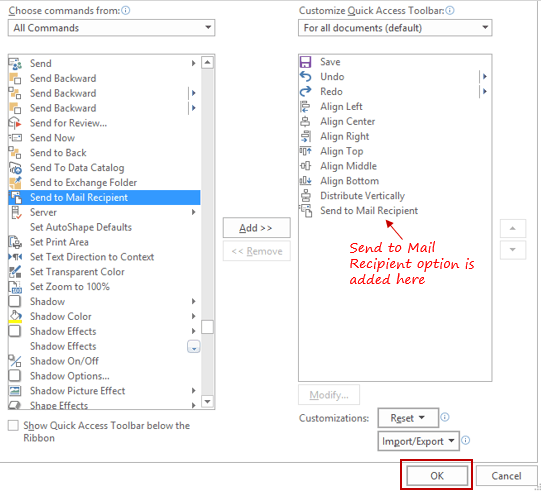 Scroll Down and select Send to Mail Recipient option. Click on the Add button. 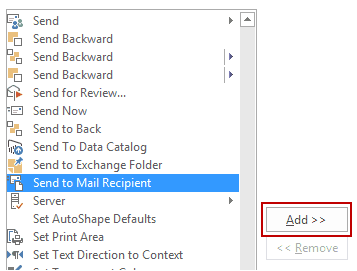 This will add the Send to Mail Recipient option on the right pane. This will add the Send to Mail Recipient icon in the Quick Access Toolbar. Send a part of the worksheet in the Email body. Send a single Excel worksheet as the Email attachment. Send the entire workbook as the email attachment. Note: I have tested this in Outlook Only. I believe it should work with your default email client as well. 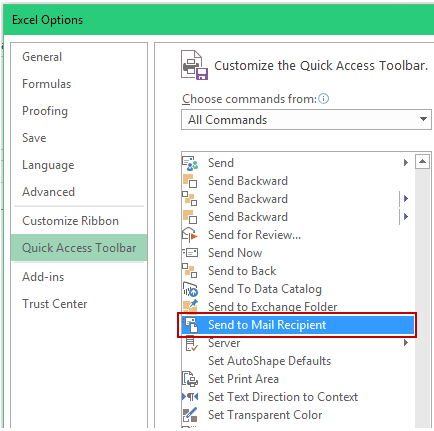 You can send a part of the worksheet (a range of cells) as the Email body using the Send to Mail Recipient option that we added to the Quick Access Toolbar. Activate the worksheet from which you want to email a range of cells. Click on the Send of Mail Recipient icon from the Quick Access Toolbar. In the E-mail prompt that opens, select ‘Send the current sheet as the message body’ and click OK. It will make the current worksheet as the body of an outbound email. It will automatically open the default email client on your system and have the worksheet as a part of the Email body. If you select a range of cells, it will only send the selection as a part of the email body. Else, it will send the entire worksheet. Note that when you use the above method to send a part of the worksheet in the email body, it does not retain any functionality of an Excel Worksheet. This could be helpful if you want to quickly send a part of a bigger data set, instead of sending the entire worksheet. You may want to send a single Excel worksheet (from many worksheets in the workbook) as the email attachment. To do this, you need to create a new workbook with that single sheet, and then send it using the Send to Email Recipient. 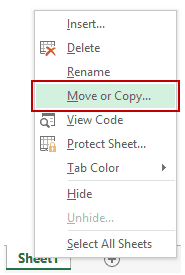 Right-click on the sheet that you want to send and select Move or Copy. 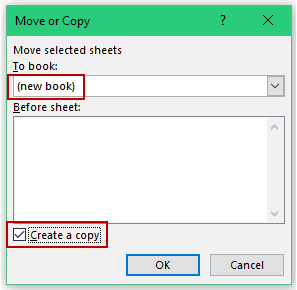 In the Move or Copy dialogue box, select (new book) under the To book drop down. Also, check the Create a copy option at the bottom left. Click OK. This will create a new workbook that will have the copied worksheet only. 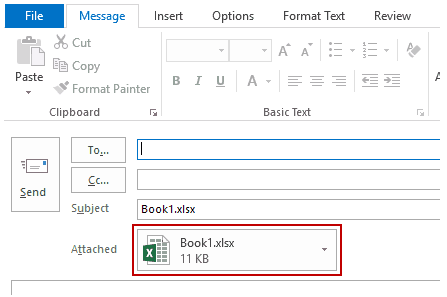 With the newly created workbook activated, click on Send to Mail Recipient icon from the Quick Access Toolbar. In the Email dialogue box, select the option ‘Send the entire workbook as an attachment’. Click OK. This will open an outbound email with the workbook attached. Since this is the new workbook that we created, and only has one sheet (that we moved), you are sending a single worksheet only. You can easily send the entire workbook by attaching it as a part of the email. Click on Send to Mail Recipient from the Quick Access Toolbar. Click OK. This will open an outbound email with the workbook attached to it. While you can do all the above-mentioned things without using the Send to Mail recipient option, it does speed up the process and makes it more efficient. 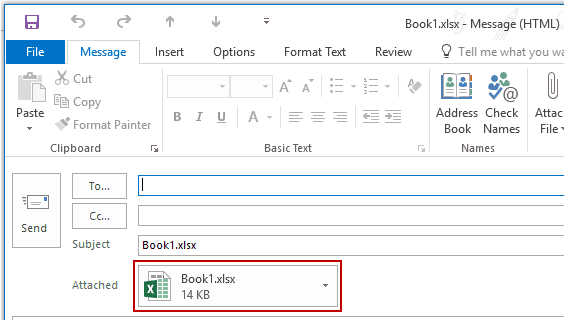 Send Email From Excel Using Hyperlink Function. 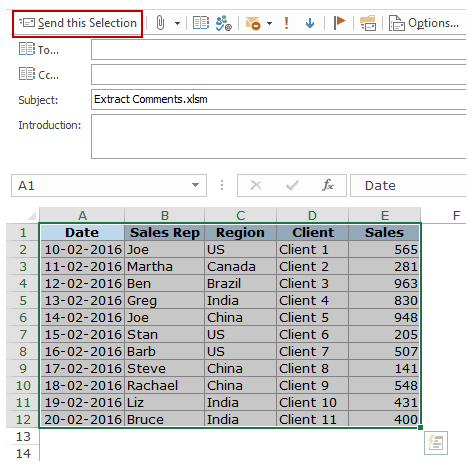 Extract Usernames from Email Ids in Excel. Any solution for Gmail yet? Our company has converted to Gmail and the loss of this function is devastating to productivity. If you have any tips for Gmail users, please advise. I was very excited to fine your clearly written instructions for attaching a single worksheet from a workbook to an email. Unfortunately, as I was going through the tutorial, I came to a screeching halt when I didn’t have any of the Send commands listed under the ‘All Commands’ Quick Access Toolbar menu. What am I doing wrong? FYI. Not working for Lotus Notes. Its awesome…………. Really very useful. Please write me how to operate it in gmail,rediffmail or other except out look. Excellent options its very useful. Very nice! I never thought of doing this. Question: does this need to be tied to Outlook or can this be used with gmail or yahoo mail? Still, this is a fascinating feature.